So...what to say about this one. It's Tina Fey. I knew there was going to be some funny tidbits, and there were.I can't say that this book read much different than any other comedian's life-to-book musings. It's done in the familiar style of - one story, new header, next story - much like a Chelsea Handler or "insert random comedian here" type of book.Maybe I'm just now finding out how I'm very not fond of picking through stories and finding myself giving one of them thumbs up, and the next one thumbs down. This herky-jerky style of storytelling doesn't really do it for me. Oh, wait. This is why I rarely read anthologies. Yes, I guess I did know this before. 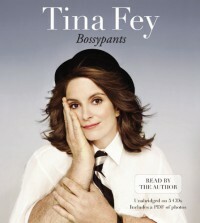 *smack forehead*However, there were some gems in the book because Tina is one funny lady. I've loved almost everything she's done in both movies and television, and when she writes comedy, she's gooood. But, and I say this with some guilt, I didn't really care for her personal life stories and play advice. I'd rather she just stick to making me laugh.